Back in elementary school, my school would take classes on field trips to the Kansas City Zoo at least twice a year. On one of the occasions, instead of checking out the various animals dotting the grounds, we’d instead seek air conditioned or heated shelter to watch movies at the Sprint IMAX Theater. The film fare would usually be a nature documentary or some good-intentioned PG movie. If the Sprint IMAX Theater was still around, I could see “Alpha” being used as an excuse for a field trip. 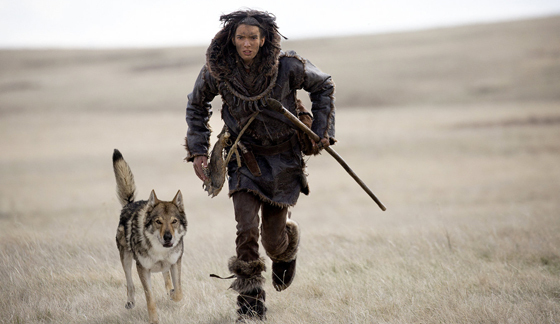 Set 20,000 years ago in Europe, “Alpha” follows Keda (Smit-McPhee), who’s been left for dead by his tribesmen and father, after a bison hunting expedition. Accompany Keda on his journey back home is an unlikely ally, an injured wolf-dog that he nurses back to health. Pitched as the origins of man’s best friend, this movie is only mildly entertaining because of the elements the human and his four-legged friend encounter. Otherwise it’s a humdrum trip back in time. It makes noble attempts at visual storytelling, by having very little dialogue, and when primitive man does open its mouth, it’s gibberish that’s translated through on-screen captioning. It may have actually played better without, forcing audiences to immerse themselves further into the Ice Age experience. Instead the movie dumbs itself down a lot, and even throws in some coming-of-age storytelling tropes in for good measure. “Alpha” could serve as a starting point for young ones interested in human history, but their parents may find themselves rolling their eyes or checking their phones. 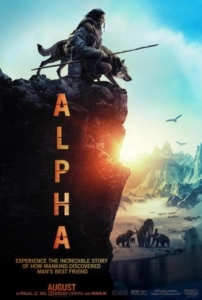 Director and writer Albert Hughes has a spotty history, but with “Alpha” has shown a little growth visually and narratively. I can’t help but think that ALPHA may have been a much better and nuanced film in someone else’s hands. There’s a lot of potential, but the finished product, while being polished and dazzling, feels like a mix of unnecessary studio meddling and dog-lover peddling.